When I’m traveling (and most of the time when I’m not) my camera is always with me and I usually make it a point to shoot as much as I can. Luckily, hard drive space is (relatively) cheap, but the pics pile up fast! Much to Laura’s chagrin, I am just getting around to processing the images that I shot while we took a cruise to Mexico over the Christmas holidays. With only a half day in Cabo San Lucas, Laura and I wanted to make the best of our last day in paradise. We jumped into a water taxi after taking a ferry from the cruise ship to the harbor and we were off on our last adventure of the trip. Zipping around in the water taxi with our guide Juan did seem a little sketchy but that may have been because I was standing up while we were moving trying to get shots like the one above. After our adventures in the water taxi while touring the waters around El Arco, we stopped over at Lover’s Beach to relax on the sand for a couple of hours before we had to head back to the ship. It was truly a morning in paradise as Laura and I chilled on the beach and swam in the warm waters of the Sea of Cortez. I’ve got many more images from Mexico (and more from a couple of days in Hollywood afterward), so I better get crackin’ and see what else I can dig up! 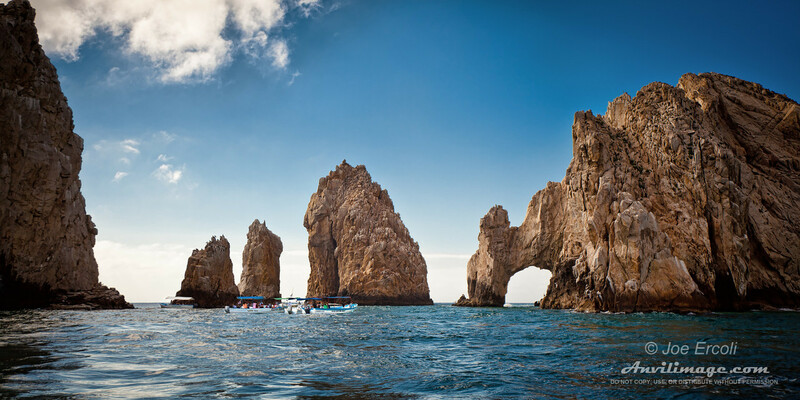 This entry was posted on Friday, April 15th, 2011 at 10:30 am	and is filed under Blog, Photos and tagged with Arco, boat, Cabo, Cabo San Lucas, El Arco, Lucas, Mexico, ocean, paradise, rock formation, San, sandstone, tropical, water taxi. You can follow any responses to this entry through the RSS 2.0 feed.